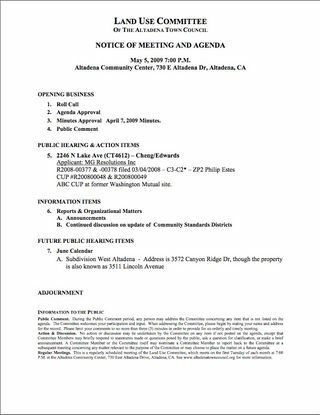 Attached is the Agenda for the Land Use Committee meeting scheduled for May 5, 2009. There will be a public hearing on the proposed new development located at 2246 N. Lake Ave. This is the old WalMu site. The development is expected to be a two story 51,000 sqft commercial structure. The developer is requesting two Conditional Use Permits to allow alcohol sales by two proposed tenants, Rite-Aide Pharmacy and Fresh and Easy Market. The Land Use Committee meets at the community center, 730 E. Altadena Drive, 7 PM.